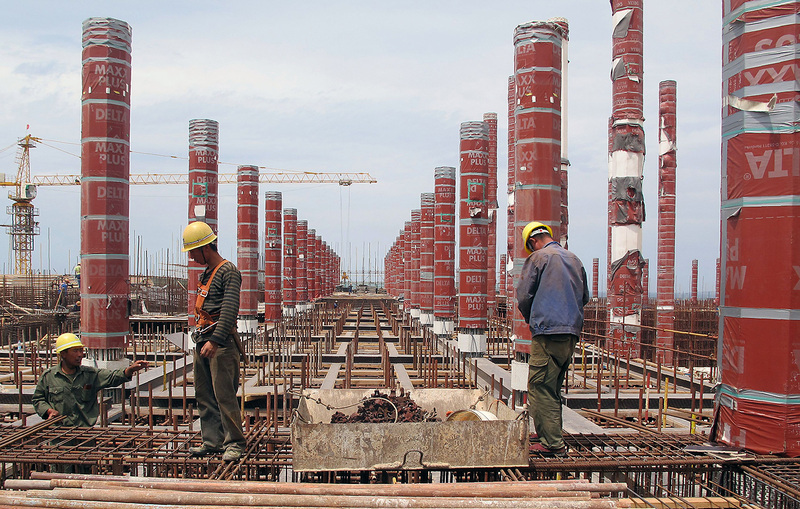 Chinese laborers work at the construction site of the third largest mosque in Algiers, and the largest in Africa, in 2016. The Djamaa El Djazair mosque was built as part of a complex that includes a one-million-book library, a Koranic school, and a museum of Islamic art and history. The Chinese build more infrastructure than any other country (foreign or African) in Africa. Chinese banks are financing billions of dollars in new loans, aid packages, and other deals to build badly-needed infrastructure across the continent, and Chinese companies are doing most of the engineering and construction work. Between 2009 and 2014, the Chinese signed $328 billion in construction projects in Africa, an average of $54 billion a year, according to data from the international law firm Baker and McKenzie. This trend is widely expected to continue as Beijing turns to its new development bank, the Asian Infrastructure Investment Bank (AIIB), to focus more of its economic diplomacy around the world on building infrastructure. Even though the Chinese are making an enormous contribution to Africa’s infrastructure development, there is a still a pervasive misperception that Chinese-built roads, bridges, and other construction projects are of poor quality. Media reports of Chinese-made roads that quickly fall apart in Ethiopia or hospitals built by Chinese contractors in Angola that never opened due to cracks, have come to dominate many peoples’ perceptions of the quality of work performed by the Chinese. New research, though, demonstrates that those anecdotes do not reflect the reality about the building quality and reliability of Chinese construction work in Africa. Jamie Farrell, a Master’s candidate at Johns Hopkins University in the United States, researched how Chinese contractors, compared to those from OECD countries, performed in World Bank contracts in Africa. The World Bank is probably one of the best sources for information to do this kind of comparison, given that China now wins more construction contracts from the Bank than any other country in the world. In fact, between 2007 and 2015, Chinese companies won almost a third of all World Bank infrastructure projects in Africa. So there is a lot of data to work with to compare both Chinese and OECD countries’ performance. Jamie joins Eric and Cobus to discuss why the Chinese continue to have such a bad reputation for the quality of their infrastructure development work in Africa despite the fact that the data proves otherwise.